Employers have a duty to accommodate employees to the point of undue hardship. This accommodation is particularly applicable in cases where the employee has a disability- transient or non- transient. As discussed in other blog posts (see: terminated based on disability), a disability can be many things, varying from medical conditions such as sleep apnea to addictions such as alcoholism. Several other matters such as stress, anxiety, depression and even sadness can also now be part of the spectrums in the DSM-5. Since judges and arbitrators are legal and not medical professionals there is a tenancy to give deference to manuals such as the DSM-5. This effectively means that with an expansion of the manual there is a potential expansion of what is considered a disability in Ontario. The reason why these resources are helpful are because they establish grounds for accommodation in situations where an employee has a recognized disability. These changes give ammunition to employees to argue that the newly added disorders are disabilities under Ontario law and therefore protected. If they are protected then the protection is full, and very strong. By characterizing and officiating legal issues as medical issues, individuals with designated disabilities are able to strengthen their case in a court of law and create additional liability for their employers. The study of law takes legal professionals in many directions. Clients don’t always have an issue that can be solved via a reading of a specific statute or case. In the Employment Law area alone, specializing lawyers can have a range of client complaints in the Human Rights sector, requiring them to read up on non-legal industry standards and established tests. Just because a lawyer primarily deals with factual and legal issues does not mean that they will be confined to legal publications and statutes when it comes to case preparation. A good lawyer knows how to utilize the proper industry-related resources to their client’s advantage. Typically, in an employment matter involving disabilities, a legal professional would rely upon the Human Rights Code for a definition on what falls within the legal term of “disability”. Psychological disorders are recognized under the Human Rights Code as a disability. Often, legal professionals will need additional information to use in court to support a case involving mental illness, and will use an industry-specific resource to educate the trier of fact. 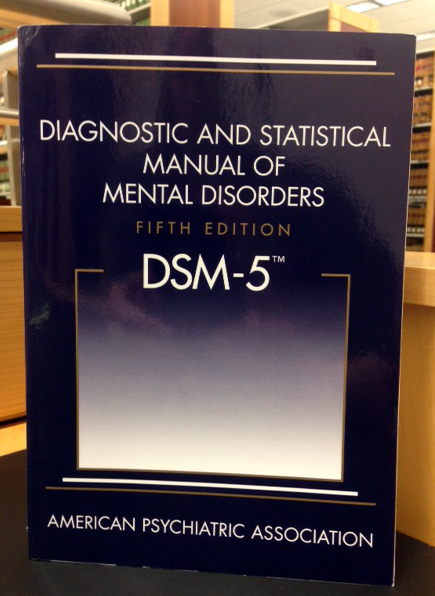 The DSM-5 has been cited in cases before. One such case was N.S. v. C.N. O.J. No. 566; 2013 ONSC 556; 34 R.F.L. (7th) 296; 227 A.C.W.S. (3d) 156; 2013 CarswellOnt 3021. This Family Law case involved a dispute over divorce and parent-child visitation arrangements. When the court came to discuss the issue of “parental alienation” (PAS) – that is to say, whether one parent had attempted to reinforce the child’s image of the other in a negative light, the court inquired whether PAS was in the DSM-5’s listed disorders. PAS was not listed, and so the court considered other factors surrounding the parent-child relationship instead. The court ruled that the parents would share their child’s expenses 50%, and that neither parent was to discuss the other in a negative light while the child was present. Another medical resource cited in cases is the Current Medical Diagnosis and Treatment Handbook (CMDT). It was cited in the case of Lurtz v. Duchesne  O.J. No. 1540;  O.T.C. 319; 122 A.C.W.S. (3d) 384, in which a medical practitioner was held liable for misdiagnosing her patient (the Plaintiff) and in doing so, failing to rule out the illness she actually had, acromegaly (a disease which involves tissue overgrowth). It was questioned whether the physician had correctly followed the steps for acromegaly testing provided in the CMDT, and the steps were cited directly. Because she had not conducted a physical examination, or carried out the steps as outlined in the CMDT, the physician was found to be 80% liable for her patient’s damages. Legal Professionals are held to a very high standard. They are expected to assist their clients by conducting the appropriate research which is necessary to build a strong case. Knowing how to utilize resources like the CMDT and DSM-5 is crucial when dealing with clients which have issues relating to disability, medical conditions, and mental illnesses. Contact Monkhouse Law today, to get additional information on how resources such as the DSM-5 and CMDT can strengthen your case.